This was a school trip to Switzerland from Lansdowne or St. Chad’s School after the 1953’s Floods. Valerie Anderson is first from the right in this photo. She can’t remembered any other names who went on the trip with her. Can you help? 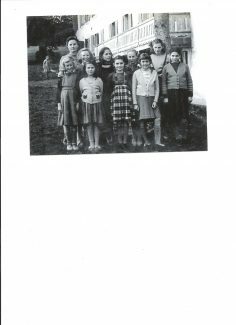 I am in this photo in front 1st right.My Name was Iris Smith. The girl in front 2nd left is Felicity Stokes and Janice Pears is at the back 2nd right. We shared a room in Switzerland in I think it was 1952.The trips were organised by a religious group I think were the Plymouth brethen.We were away for 6weeks and we had a wonderful time it cost our parents £10 and was part of the help from the flood relief. Sorry cant remember other girls names but we were from Manor Junior School.